If you want to know if VAAI is supported by your storage you should use the commandline tool “esxcli”. With this command you will get the a detailed status for all VAAI primitives (ATS, Clone, Zero and Delete). Now you will get an detailed view which VAAI primitives are supported or not supported. 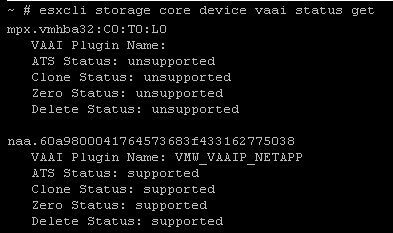 Can I use vCenter to display the VAAI status, too? …if Hardware Acceleration is “supported”, it means, that all four primitives are supported. …if you see “unsupported”, it means, that none of the primitives is supported. …and last but not least you may see “unknown” – this means that one or more (but not all four) primitives are supported. As long as the Hardware Acceleration Status is supported or unsupported there is no need to use the command line tool. But if the status is “unknown” and you need more information, the esxcli command will be the best way for you.